Posh striker Tom Nichols is about to score his second goal against Chesterfield. Photo: Joe Dent/theposh.com. Peterborough United striker Tom Nichols thanked a pre-match motivational message from his mother for his two-goal display in the 5-2 win over Chesterfield at the ABAX Stadium yesterday (December 10). Nichols is now the Posh top scorer this season after taking his tally to eight goals in all competitions. He scored after 25 seconds and again in the second-half as Posh maintained sixth position in League One. Posh striker Tom Nichols celebrates a goal after just 25 seconds against Chesterfield. Photo: Joe Dent/theposh.com. Chesterfield bossed most of the first-half though and only a stunning strike from Gwion Edwards in added time enabled Posh to go into the interval on level terms. 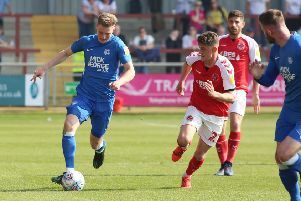 Posh manager Grant McCann’s half-time rollocking inspired the players, but Nichols, who scored on his Posh debut at Chesterfield last season, also revealed his mother played a part before the game by triggering some fond memories. “My mum text me before the game to remind me I have a good scoring record against Chesterfield,” Nichols, who was scoring for the first time in six matches, stated. “And she was right as usual. It was great to score so early and again later on when Paul Taylor teed me up perfectly. “I’m quite happy with my goals return at this stage of the season. Obviously as a striker I want more goals, but in a strange way my first goal didn’t do the team any favours. Scenes of delight after Paul Taylor's goal for Posh against Chesterfield. Photo: Joe Dent/theposh.com. “We didn’t intend to sit back and take our foot off the gas. It just happened, but the manager quite rightly got stuck into us at half-time and it worked. We had been outplayed and Chesterfield deserved to be winning at half-time, but Gwion baled us out with his ‘worldie’ and in the second half we played very well. “There are not many teams in the world who play well every week, but we are getting there. Gwion’s goal changed the tone of this game and it was great for the forwards to contribute to a good win. Nichols was the main benificiary of an inspired display from Taylor, who scored one goal and claimed two assists. Taylor took on the role normally performed by Marcus Maddison who missed this game because of an ankle injury. “Paul is an amazing footballer,” Nichols added. “He can do things on the ball that no-one else can do. He deserved his goal and it was good to show we can play well without Marcus Maddison. “Some people don’t think we can play without Marcus. Marcus is a great player for us, but we are far from a one-man team. Paul has some phenomenal tricks up his sleeve and it’s a pleasure to watch him play. Posh are next in League One action at Charlton next Saturday (December 17). Their festive progamme brings home games against Gillingham (December 26) and Coventry (December 30) and an away game at League One leaders Scunthorpe (January 2). Posh also host Notts County in an FA Cup second round replay on Tuesday, December 20. The winners will play away to Chelsea in the third round on January 8.